for books, studying and productivity! A boy communes with the gods by talking to a pillar. The ‘hibiscus girl’ has her head in the clouds and feet gently planted in her husband’s home. Two women, married to the same man, find a strange camaraderie binding them together. The whole town gathers to save the friendly neighbourhood shopkeeper’s ice cream from spoiling in the heat. Short-tempered Seshadri hides a terrible shame in his outbursts. A grandfather passes on the magic of self-belief to his grandson. 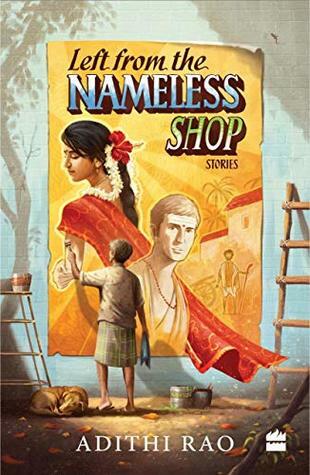 Reminiscent of Malgudi Days, Adithi Rao’s debut Left from the Nameless Shop is a charming collection of interconnected stories set in the 1980s featuring the residents of Rudrapura, a small, fictitious town in Karnataka. This is a place bubbling with energy and the sense of community – one you probably lived in and loved while growing up. These are stories of the life you have left behind. One that you hope to return to. This book has a typical Indian style to it and heavily reminded me of the Malgudi Days by R.K. Narayan, which was the inspiration for the book. I think the most interesting part of the book was the writing. It was simple yet vivid, I could almost see the whole scenes happening before my eyes. The smell, taste and colours were vibrant throughout the book and as a reader, it made me visualize the story line more clearly. The first story of the book was really sad and interesting. It spoke a lot about love and courage and the characters in it made me fall in love with it. When you start reading this book, its like you cannot stop. I fell into one of my reading slumps in December so could not complete it. But in January, I did finish it in 2 days! So, if you are searching for some nostalgic old Malgudi – type stories then definitely pick this book up and you wont regret it! Thank you Harper Collins India for sending a copy. Previous Post Welcome to the book launch of The Forest of Enchantments by Chitra Banerjee Divakaruni…. Next Post Excerpt from Justice Gone by N. Lombardi Jr…. ” Asian Book Bloggers Directory!